Denver can save lives and prevent serious injuries by focusing resources on redesigning 27 especially dangerous streets. Combined, these 27 streets are just 5 percent of the city’s street network, but they were the site of 130 deadly collisions, or about 50 percent of all traffic fatalities, between 2011 and 2015. Improving safety on these streets, which the city calls the “high-injury network,” will be a core focus of the Hancock administration’s Vision Zero plan. The vast majority of traffic deaths and serious injuries occur on wide, multi-lane roads that feel like highways but cut through city neighborhoods. 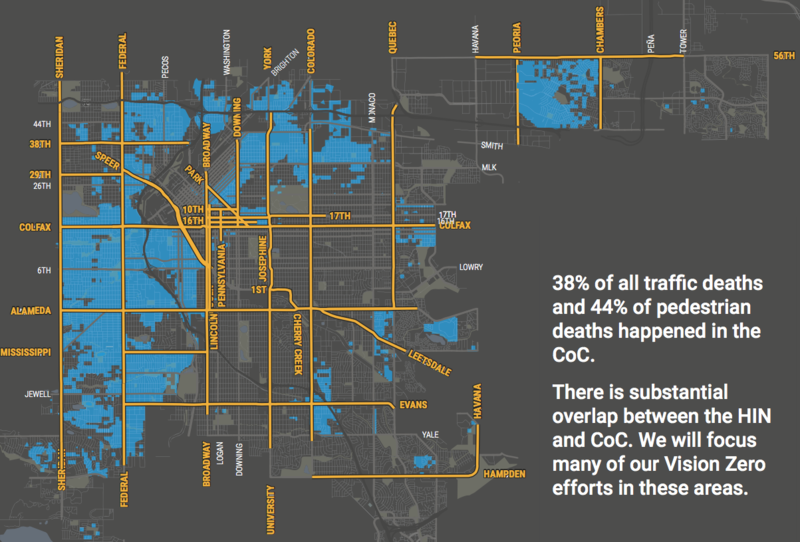 Streets like Federal Boulevard, Colfax Avenue, Colorado Boulevard, and Broadway — what Denver Public Works calls “arterial” streets — make up 96 percent of the high-injury network. In tandem with the high-injury network, the city will prioritize “communities of concern” — areas that suffer a disproportionate share of traffic injuries and elevated obesity rates, while also having low levels of car ownership and a high concentration of schools, community centers, and elderly residents. These areas account for 44 percent of all pedestrian deaths. Most of these streets are under the Colorado Department of Transportation’s jurisdiction, so Denver will have to assert itself and work with the state to engineer redesigns that reduce lethal driving speeds and prioritize the most vulnerable people on the street. The high injury network is a key part of the Vision Zero action plan to improve street safety for everyone, which we’ll have more coverage on later in the week. A big part of the problem is with traffic light timing. When a left turn light only allows for 1 car to make it through the light (and multiple cars waiting to turn) you can bet that there will red light runners. Denver just lacks the infrastructure for this overgrowth of people moving to the area. Widening roads will not fix the problem. When people move to Colorado maybe they need to take a driver safety class, before getting their Colorado license! In some target areas to widen roads, will result in many people loosing their front lawns, if not their total houses! This may be fact, but that doesn’t mean the 27 streets caused those deaths. You have to dig into the reasons those deaths happened to make a statement like that. Case in point, if someone is not paying attention and they rear-end or swerve off the road and die, the road didn’t cause that. You’ll never never never be able to design for stupidity or inattentiveness. If you can’t wrap your head around the fact that streets engineered for high speed elevate the likelihood that motorist stupidity and inattentiveness will produce fatal results, you should find a new line of work. elevate, but don’t cause…that’s the human factor. “Elevate, but don’t cause” is a distinction without a difference. If you engineer the streets to induce safer driving behaviors, you will get safer driving. This is a noncontroversial statement throughout the civilized world of transportation engineering. Yes, I agree safer for sure. Still doesn’t matter how well you engineer the street, human factor will still and always be there. Drunk driving, impaired driving, phone use, weather, etc…providing stats is nice, but let’s only use the ones related to engineering as those are the ones humans can control. Wrap your head around that…humans will never be able to engineer transportation without risk. Let’s focus on what can be controlled. The thing is, there’s no neat dividing line between crashes that are caused by human error and those that are not. In a sense, every crash is caused by human error — if everyone used the road system according to the rules, there would be no crashes. So, sure, engineering doesn’t eliminate human error, but it can make the consequences of human error much less severe. That is the core framework for Vision Zero policies in Sweden: design systems where human error is not lethal. When they “focus on what can be controlled,” they’re doing things like reducing the prevalence of driving speeds that can cause death on impact. Even impaired and inattentive drivers will, generally speaking, be less dangerous in such environments. There is a staggering difference in safety outcomes between surface transportation systems that have been engineered with safety as a guiding principle and those that are engineered to maximize peak vehicle throughput. If you prize wide open roads above all, you’re going to be at odds with what Denver has to do to get traffic deaths down. While I don’t consider myself particularly conservative, still, there’s only so much liberals can do to “save the children” or the world from themselves. At some point people have to be personally responsible (and liable) for their own actions. I certainly support the ACA, for example, bcuz that makes good common sense and is a practical application that can obviously benefit all of our living friends. Sadly, though, there’s only so much money in this finite world we live in. Have you ever left Denver? There are dozens if not hundreds of similarly sized cities in the world that have far lower traffic death rates. They don’t have safer streets because they’ve attained a high communal standard of personal responsibility. They have safer streets because that’s how their land use and transportation systems are designed and engineered. Have you ever left Denver? As as matter of fact, yes. I have now lived in Phoenix for 10 years. Where would you like me to start about the number of crashes/deaths that occur down here. Ofc, Phoenix is a big city, now the 5th most populated city (in our country). Hate to break the news but it’s rather late in the game to rebuild the city from scratch. Second, not sure how many voters want to emulate European or other cities of the world even if the tens of $billions needed were just sitting around looking for something to do. Okay, so we’ve moved past the “engineering doesn’t matter” argument, now we’re on to the “it’s too expensive” argument. Progress. If engineering won’t fix stupid and the $billions needed to try don’t exist sounds like a bigley conundrum to me. Speed causes crashes. Road engineering leads to speed. Yes, increased speed does make any crash more lethal. Road engineering, depending on how it’s done, can lead to many things, including, potentially, both lower and higher speeds, and reductions in the number and severity of crashes, or not. Simply reducing speed limits, absent draconian enforcement, will not have any real impact on either actual speeds or the number and severity of accidents. And, in reality, focusing enforcement efforts on a) distracted driving and b) failure to follow traffic control devices and the established rules on yielding at intersections, instead of just “speed”, will yield better results when it comes to crash statistics. Nobody said simple reducing speed limits would do anything. Speed causes crashes. Be pedantic if you want. Driving faster will lead to more crashes and more deaths. Not being pedantic. Rural freeways have higher speeds and lower crash rates than urban surface streets because of far more conflict points, along with denser traffic. If speed were the primary killer, the opposite would be true! Denver has a lot of crashes because a lot of drivers are either from out of town or recent newcomers, there are a fair number of intoxicated drivers, intoxicated bike riders, and pedestrians who are intoxicated also, while a number of our main arteries are exceeding their design capacity, and due to our economy most everyone driving is in a hurry while a lot of people can’t afford to drive, thanks in-part of the strength of our economy and very high housing costs. Quite a few of the involved arteries are Federally-regulated heavy truck routes too, and everyone knows that it takes a loaded heavy truck three times the distance to stop from the same speed as the average family sedan can stop within. We are probably lucky that we are having as few accidents as we have been. Yes, it’s pedantic. Of course context matters. All other things being equal, increasing speed will lead to more crashes and more deaths. 50+ MPH can be a relatively safe speed on a limited-access freeway. Driving at that speed in other settings where there are intersections, driveways, alleys, sidewalks, bikes, people, you know “conflict points”, will never be safe. But the design of many urban streets tells people that those kind of speeds are ok. That leads to more crashes and more deaths. It’s the fault of those that built the streets, and it’s preventable. Use design to enforce slower speeds and there will be fewer crashes, and fewer people killed. Sorry, this is so wrong. According to your logic, the mere existence of a crowded urban place is the cause of traffic deaths. A crowded urban area will have more deaths (and more births), per square mile, than rural areas simply because there are more people! The reason deaths are higher in urban areas are both more people and more conflict points (intersections). Yes, speed is a contributing factor. No, it is not the primary factor. If it were, we’d all be driving vehicles limited to 10 mph, “because you can never be too safe”. The reality is that all the “evils” associated with motorized transportation are tolerated is because of the (perceived?) benefits that higher speeds and personal comfort motor vehicles offer. I’ll agree with Roads_Wide_Open but first tell me how many (bad) crashes (when known) involve driver and/or pedestrian recklessness, distracted driving /walking and/or driver/pedestrian being under the influence of who knows what? Then tell me how you intend to engineer out stupid and how much it will cost? You can’t engineer out stupid, but you can engineer out speed. Speed + stupid = death. Take out the speed, and you can prevent the majority of deaths. How many our of stupid friends give one wit about posted speed limits? You’re living in a fantasy world that doesn’t exist. Plus you’re just adding to road rage by jamming up roadways worse than need be depending on which roads you are specifically referring to. Posted speed limit means nothing. Design speed means everything. Narrow lanes, narrow roads, on-street parking, street trees, and lots of other visual cues do affect the speed people drive. It is very possible to engineer slow driving speed. Problem is we usually do the opposite. Make roads far wider than needed which encourages speeds far above the speed limit. Streets are constantly being repaved and otherwise under construction. Every time that happens we need to use new standards that place safety first. Slowing speeds an saving lives prioritized about vehicle volume. If you knew anything about Vision Zero, you’d know that. 5% of Denver streets also carry 50% (or more) of all traffic . . . kind of like complaining about speeders in your neighborhood – most of them are your neighbors! The fact 50% occur on these streets is because people use them and thus they are a priority to improve, not necessarily that they are intrinsically bad, just worth improving if possible given demand.